Stanley CHAK | LRT Consulting - Learning Resources & Technologies Ltd.
Stanley often contributes to sector-wide or professional bodies by sharing his leadership insights, research findings and white-papers. 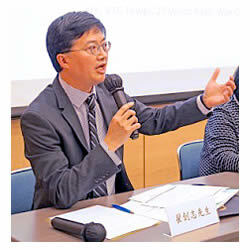 Recent examples include “Professional Writer’s Sharing of the Qualifications Framework for the HRM Sector” by the Qualifications Framework Secretariat (QFS), the Smart Hong Kong campaign titled “Innovation, Transformation and Management Upgrade” by Hong Kong Trade Development Council (HKTDC), the “HR Forum on Talent Development” by Hong Kong Council of Social Services (HKCSS), etc. Prior to becoming an independent consultant in 1996, Stanley built solid foundation in training and organization development through working with two most successful conglomerates in the Asia Pacific Region, namely Jardine Pacific and Swire Group. The diverse business nature of the two conglomerates enabled Stanley to develop his business acumen in various industries and flexibility in working with different cultures and people. In addition to his experience in the corporate world, Stanley worked with Caritas Hong Kong in developing youth and community leaders between 1982 and 1988.